It had been a long time coming, but finally the first draft in five years was here, as Smackdown moved to Tuesday nights and went live full-time. After RAW had set the stage the night before, with General Managers being chosen, a "controversial" end to a WWE Championship match and a huge twelve man tag bout, how would the biggest Smackdown in years go about putting the show? Of course, the main driving narrative throughout the whole show was the Draft itself, with Monday Night RAW's Stephanie McMahon & Mick Foley and Smackdown Live's Shane McMahon and Daniel Bryan appearing at the top of the entrance ramp a total of six times to name their chosen picks. Before I get into the nitty gritty of the process, it's probably important to mention who ended up where. RAW would draft Seth Rollins, Women's Champion Charlotte, NXT's Finn Balor, Roman Reigns, Brock Lesnar, Tag Team Champions The New Day, Sami Zayn, Sasha Banks, Chris Jericho, United States Champion Rusev, Lana, Kevin Owens, Enzo & Cass, Anderson & Gallows, The Big Show, NXT's Nia Jaxx, Neville, Cesaro and Sheamus. Smackdown would counter with WWE Champion Dean Ambrose, AJ Styles, John Cena, Randy Orton, Bray Wyatt, Becky Lynch, Intercontinental Champion The Miz, Maryse, Baron Corbin, NXT's American Alpha, Dolph Ziggler, Natalya and Alberto Del Rio. That means RAW ended the show with 23 seperate roster member and Smackdown had just 14. The segments themselves all managed to maintain my attention, mainly through the intrigue of seeing who would end up where, rather than the back and forth bitching between the two sets of Commissioners and General Managers. It was pretty clear from the outset that Rollins and Ambrose would be the first two picks, due to their WWE Championship match, and after RAW the night earlier it'd have been a major shock with the pair had been on different brands. The biggest reactions of the evening seemed to be for the NXT guys as that was where the only real mystery for show lay. Getting to see Finn Balor, American Alpha and Nia Jaxx get the chance to spread their wings and perform on RAW or Smackdown is a pretty exciting prospect. Other things that stood out for me was John Cena and Randy Orton both getting drafted to Smackdown, The Club going their separate ways, Sami Zayn and Kevin Owens remaining on the same show and the emphasis of putting women in high profile spots within the draft (eg. Charlotte was RAW's 2nd pick and only the third overall). Dean Ambrose would retain his WWE Championship over Seth Rollins [Dirty Deeds] in a match that took on a much different form to the battle that we saw the night before. Rollins would dominate a big portion of the bout after attacking Ambrose before the bell had rung. This gave the match a real momentum heading straight out of the box and it showed clearly the frustration that had built up inside of Rollins, following the previous nights title shenanigans, as well as showing animosity for his former Shield partner. Ambrose would receive a brilliant hope spot when he was able to send Rollins over the barricade into the time keepers area, only to end getting chucked onto another part of the wall himself. The match seemed to come up just a little bit short, being about half the length of their RAW clash, which left the finish feeling a little flat for me. However, I did like the idea that the match both begun and ended with Rollins attempting to hit a Falcon Arrow, with the second try being reversed into Dirty Deeds by Ambrose for the win. Rounding off the top portion of the card, John Cena would pick up a victory over Luke Gallows [Attitude Adjustment] in his first Smackdown singles bout this year. The best bit about the match for me was that it continued through the ad break, being windowed on the screen. I'm surprised that this isn't done more often. The finish ended up winding me up though, as after Gallows had been able to block an Attitude Adjustment by Cena with a kick, Big Cass & Enzo Amore would call for The Club's AJ Styles and Karl Anderson to get into the ring. This would end with Cass & Amore sending them to the outside, before Cena would jump to his feet and deliver an AA for the win. Cena and Gallows had to lie on the match for an age, which made it very hard to suspend my disbelief whilst watching, then for them to suddenly spring to their feet and then to do a one move finish was more than a little lame. At the top of the undercard, Bray Wyatt would defeat Xavier Woods [Sister Abigail] in a short but fun match. 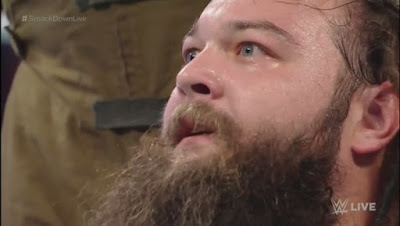 The match continued to play off Woods' fear of the Wyatt Family, beginning with a creepy moment as Wyatt appeared to be willing Woods to join the group and Woods' seemingly under a spell, which played well into Woods throwing a punch at his opponent. "The Seducer" would dominate the match with clubbing blows and wear downs, whilst also getting into the face of the other New Day members at the ringside, he looked like a complete beast throughout.. The finish was cleverly designed, but completely telegraphed as Woods went for his Honor Roll clothesline at the same time as Wyatt shifted into his spider walk situation. The camera work could have been stronger to add more of surprise element to the ending, however Wyatt shifting around to get into position didn't help things either. This was however an entertaining contest that reminded the viewer of the storyline that will no doubt be a huge part of the six man tag bout between the two stables on Sunday. Women's Champion Charlotte and her protege Dana Brooke picked up some momentum before the PPV with a handicap victory over Sasha Banks [Natural Selection, Charlotte]. I have to say that despite the match going barely over two minutes, I found this to be a compelling and enjoyable match, because of the way it was put together. I was a little bit worried that we were going to see Banks pick up the win over the pairing, as WWE has taught me to suspect such a thing with their booking of the main event scene. Luckily what we got was a spirited performance from Banks, who looked in control of the match at various points, only for the numbers to eventually catch up with The Boss. Everyone came out looking good from this, and more intrigue was surely placed upon the upcoming tag team match on Sunday. Darren Young and Zack Ryder pulled out a big victory over Intercontinental Champion The Miz and United States Champion Rusev [Cross Face Chicken Wing, Young to Miz], in a match billed as "Champions v Challengers". The match had a splendid tempo, with the four men all working hard to keep that going. Whilst it was essentially your regular tag bout structure and only went just over four minutes, there were little embelishments that managed to take it beyond. Ryder hitting a nice neckbreaker out of Rusev's suplex attempt for the hot tag, as well as later hitting a dropkick off the apron onto "The Bulgarian Brute". This was definitely Young's most decisive win to date, as he debuted a new submission finisher the Cross Face Chicken Wing, which, of course, was the signature hold of his life-couch Bob Backlund. Chris Jericho defeated Cesaro [Codebreaker] in a frustratingly short contest. The action was so very good in the sub-five minute bout, that I would have loved for, at least, another five minutes. "The Swiss Superman" got a brilliant face shine in and later pulled off one of the best reversals to a Lionsault I can remember, by catching Jericho before the jump and pulling off a middle rope reverse Russian legsweep, so at least he wasn't hurt too much by his swift loss. I'm not quite sure what Jericho going over Cesaro does for anyone, especially in such a short match, as neither competitor is scheduled for a match on the upcoming PPV, although Jericho is set to host a Highlight Reel with a returning Randy Orton. Considering both men were picked for RAW on the show, you'd have expected them to allowed to really show what they can do on this special, however we had to settle for just a glimpse. In a weird segment, Sami Zayn would attack Kevin Owens as "The Prizefighter" made his way to the ring, which would lead to Kane hitting a Double Chokeslam on the pair of them. Becky Lynch also attacked Natalya before her match could begin, but this time, unfortunately, there was no Kane around to chokeslam them. Singles Match: John Cena (with Big Cass & Enzo Amore) def. Luke Gallows (with The Club - AJ Styles & Karl Anderson) in 5 minutes, 25 seconds. Tag Team Match: Darren Young & Zack Ryder (with Bob Backlund) def. United States Champion "The Bulgarian Brute" Rusev & Intercontinental Champion The Miz (with "The Ravishing Russian" Lana & Maryse) in 4 minutes, 5 seconds. Singles Match: Bray Wyatt (with The Wyatt Family - Braun Strowman & Erick Rowan) def. Tag Team Champion Xavier Woods (with Tag Team Champions The New Day - Big E & Kofi Kingston) in 4 minutes, 45 seconds. Two on One Handicap Match: Women's Champion Charlotte & Dana Brooke def. Sasha Banks in 2 minutes, 18 seconds. Singles Match: Chris Jericho def. Cesaro in 4 minutes, 52 seconds. WWE Championship Match: Dean Ambrose (C) def. Seth Rollins in 12 minutes, 17 seconds. Considering the hype that the show got going into it, the actual event was a fairly average show and a step down from Monday Night RAW the night before. The matches all came up short with only the main event going much longer than five minutes and whilst the majority of the action was technically sound and entertaining to watch, there just wasn't enough of it. Perhaps this was done to make way for the Draft itself, which took up about twenty minutes of the show, in which case it would have been much more of a satisfying show if their were less matches that went longer. The main event was obviously the strongest match on the show, with a better story than the previous nights match, but without the chance for it to be fully explored in it's run-time and therefore ended up being the lesser of the two contests. Personally, I think it would be wrong to judge the draft on this episode alone and will withhold judgment until both brands have held their own PPVs.